There is no better way to explore Costa Rica's back country than on your own ATV. The dense teak and African palm plantations combined with the rainforest climate of Quepos & Manuel Antonio create natural trails absolutely perfect for some seriously wet and wild off-road action. Unlike many ATV tours in Costa Rica, our Manuel Antonio ATV tours take place on a private plantation of over 1000 acres of primary and secondary rainforest full of rivers to cross, scenic views from the hilltops, waterfalls and best of all, all the private off-road trails you can imagine! 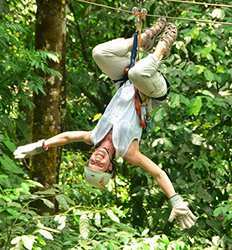 Choose our Manuel Antonio ATV Tour for strictly off-road action, or combine your off-road adventure with a canopy tour for a super shot of adrenaline. All of our ATV tours in Manuel Antonio use new fully automatic ATVs and top off the line safety equipment so you know you are going to have the best off-road experience in Costa Rica. So what are you waiting for? 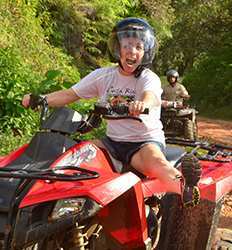 Rev up your engines and get ready for a wild ride on one of the Manuel Antonio ATV tours listed below. After taking our safety class, you are ready to drive your own fully-equipped Honda ATV into the rugged mountains. Your professional bilingual guides will lead you through rustic tropical settings, real working cattle farms, and typical Costa Rican towns like Naranjito, Londres, Villa Nueva and Esquipulas.